Since finishing the Conscious Cleanse a couple of weeks ago, I’ve tried to determine the best way to adjust my diet going forward to make sure I keep feeling good (I felt GREAT during the cleanse) without being quite so restrictive. One thing Kevin and I have started doing is eating out less, which is kind of a no brainer but we’ve been much more intentional about that lately. Our schedules get hectic, but instead of grabbing Qdoba or Thai as often, we try to plan meals in advance and have easy-to-prep things at home that we can make quickly. Lärabars: These. Are. Amazing. How did it take me so long to discover these? I especially recommend the Cashew Cookie bar, with a whopping TWO ingredients (cashews and dates). Pretty cool, huh? 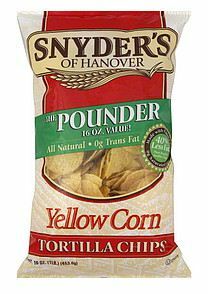 Snyder’s of Hanover tortilla chips: The perfect pair for some homemade guacamole, these chips contain just enriched yellow corn, canola oil, and salt. Nice and simple — and delicious! 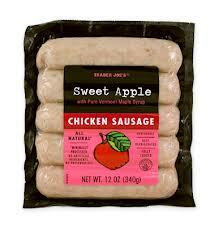 Trader Joe’s chicken sausages (in a variety of flavors): These have become a staple at the Keller house. They’re so quick and easy to prepare, and consist of chicken meat, water, seasoning, and fruit or peppers, depending on the variety. We love to serve these with a side of kale (lightly sauteed in a bit of olive oil or coconut oil and red pepper flakes). Yum! 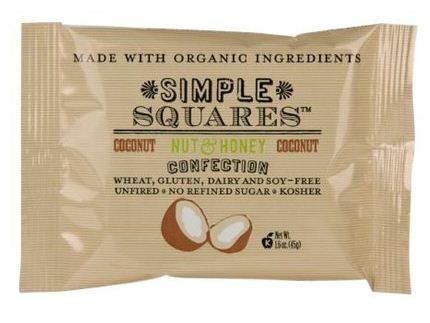 Simple Squares: Another delicious treat, these bars are wheat, gluten, dairy, and soy free and are packed full of healthful ingredients including organic unsweetened coconut, organic cashews, organic almonds, and organic honey. Yum! 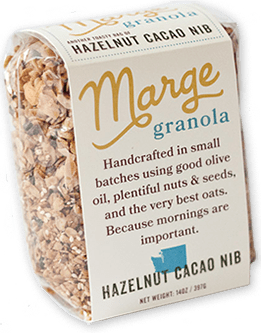 Marge Granola: I haven’t actually given this stuff a try, but it sounds incredible! I follow the blog The Kitchn, and it turns out the blog’s author, Megan Gordon, is also the owner of Seattle-based Marge Granola. After reading about this tasty and nutritious granola on her website, I can’t wait to sample it myself! I think I’d like to try the Hazelnut Cacao Nib first. 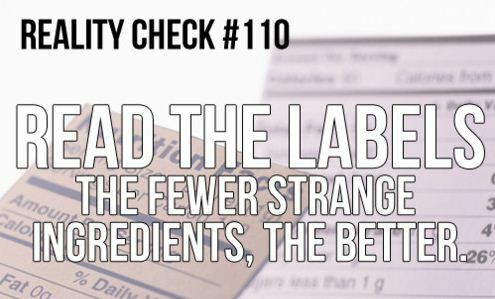 For those of you who are also trying to be conscious of the number of ingredients your foods contain, what other recommendations can you send my way? I know what you mean about preferring fewer ingredient food items. When Cameron and I buy packaged food, we are label readers, too. My recipes on the blog may not be “few ingredients,” but we work hard at cooking meals from whole ingredients. Now when I do eat packaged food that’s packed with excess preservatives, etc., my body lets me know immediately. Eric and I have been doing the same thing! Its amazing how horrible some of those “healthy” items are for you. I spend double the time at the grocery store now just checking the labels of items. Its really disappointing to know that stores are even selling food that isn’t actually food. P.S. I LOVE your blog, first friend!